It’s been one of those days weeks — and it’s only Wednesday. You know the type. Where you wake up at 6 a.m. and before you know it, you look at the clock and its 7 p.m. and you’ve barely put a dent in your to do list. Where does all the time go?! 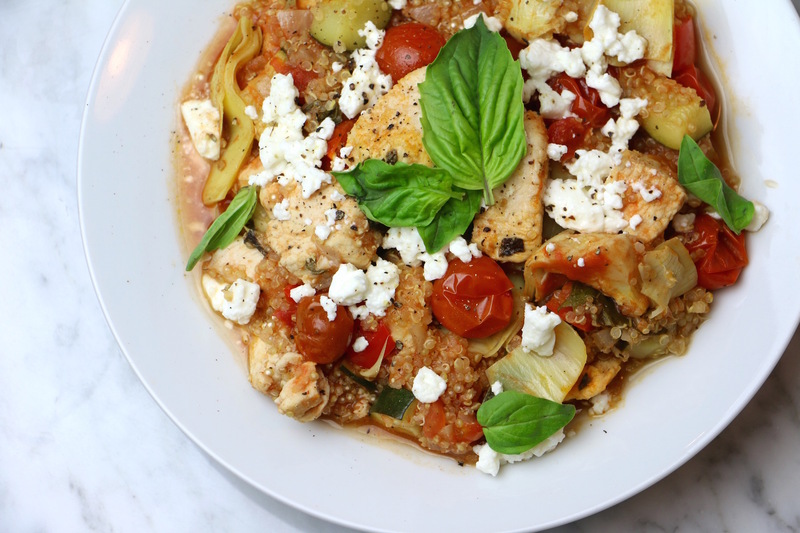 Not into this One-Pot Mediterranean Quinoa Chicken, that’s for sure. This recipe is a breeze, but we’ll get to that. The past few weeks have been really, really, ridiculous busy for me. Don’t get me wrong, I’m not looking for sympathy. I’m sure many of you are in the same boat. I just feel like venting — and also like I owe you guys an explanation for the sound of crickets that’s been filling the void around here. I recently started two internships for my nutrition program, and in addition to my coursework, it’s really jammed up my blogging schedule. Bear with me. There’s a month left in this semester and I’m hoping for a somewhat slower summer. Key word — somewhat. I will have one class this summer, but it’s not one I will ever complain about. It’s a three-week course in Genoa, Italy! You may remember, I vacationed in Italy a few years back and absolutely loved it. I can’t wait to return and explore more of the enchanting country. It was with Mediterranean vibes on the brain (and a necessity for simplicity) that I created this recipe. I know, I know. Quinoa is totally not a Mediterranean staple. You know what it is? A protein-packed ancient grain powerhouse. If you’re jonesing for authenticity though, feel free to swap pasta, rice or another grain — just make sure to adjust the liquid accordingly. This one-pot dish keeps cooking simple, and makes for a quick, easy clean-up. 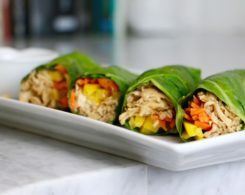 It’s full of nutrient-packed veggies like zucchini, bell pepper, and artichokes, and bursting with flavor from the fresh basil. Freshly crumbled feta cheese tops off the smorgasbord of tastes, adding a rich element to the earthy dish. I made this meal twice in the past two weeks and both times, it was hit. 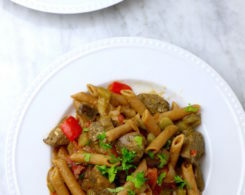 The recipe makes enough for dinner and several leftovers, so it will save you time all week long. An easy, delicious one-pot dinner full of fresh vegetables, protein-packed grains, and flavorful chicken. 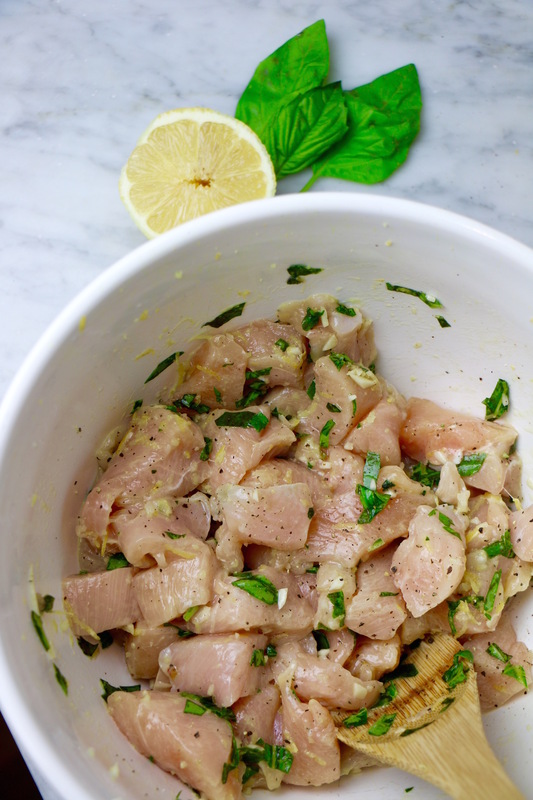 Marinate chicken with oil, half of the garlic, half of the basil, lemon juice, zest, and salt and pepper. While chicken marinates, chop the vegetables. Heat a large heavy pan over high heat, spray with oil and then add the chicken. Cook until chicken is browned, but still pink inside (about 5 minutes). Remove chicken from pan and set aside. Bring heat to medium. Spray with oil then saute onion and remaining garlic for about 1-2 minutes. Add zucchini and pepper and continue to cook for 3-4 minutes. 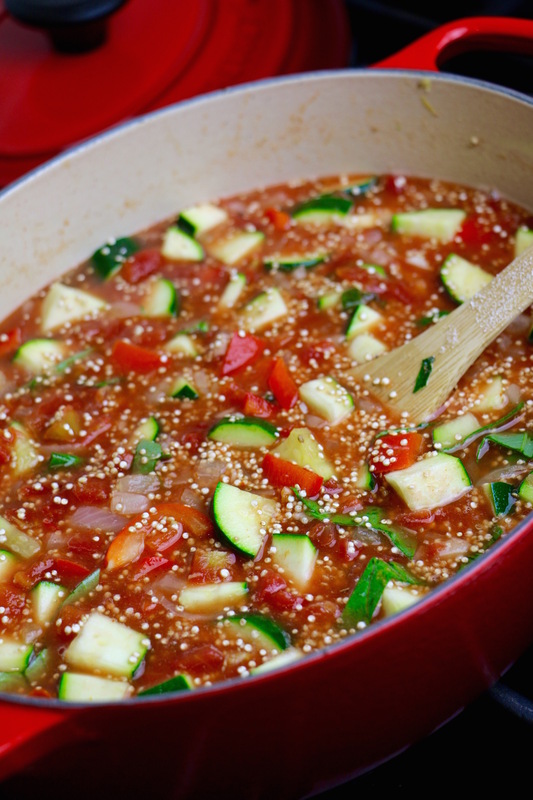 Add stock, diced tomatoes, paste, and quinoa. Stir well. Bring pot to a simmer. 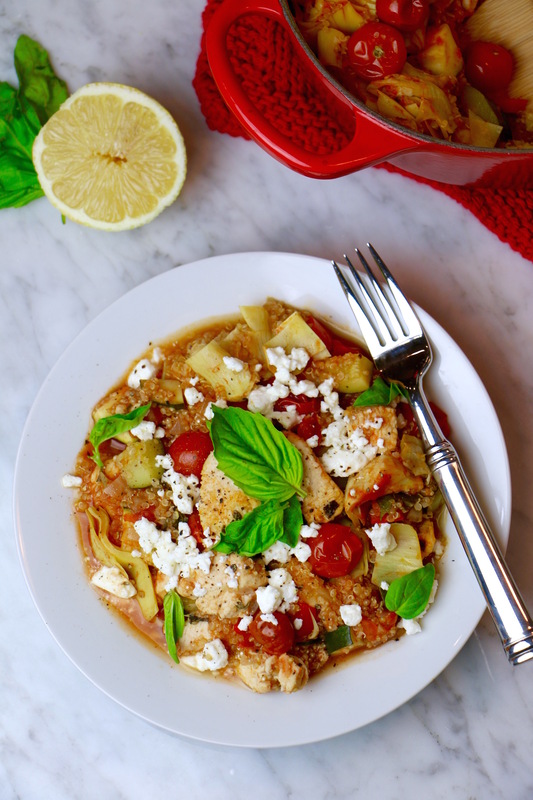 Add chicken, artichokes, and cherry tomatoes. Transfer pot to oven. Cook for 20 minutes. Cover pot and bake for an additional 20 minutes. 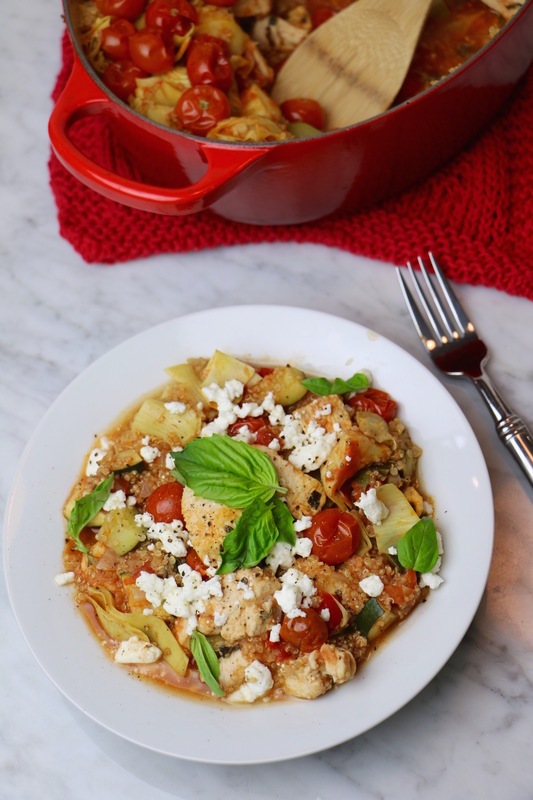 Distribute among bowls, top with remaining shredded basil and feta. An important note — don’t leave out the lemon zest. It is ahhhhmazing. So amazing that when I made this dish for my family that was in town, and realized I forgot to buy a lemon at the store, one of my in-laws (whose identity will remain a mystery for their own protection) scoured the block and snatched one off a neighboring tree for me. Don’t worry though. I have a young lemon tree growing in my own yard and have made a silent promise to promptly repay my neighbor with my first-grown fruit. All’s well that ends well. Weigh In: What’s your go-to dinner for busy weeknights? Do you have any great one-pot chicken recipes I should try? Have you ever stole borrowed a neighbor’s fruit? This looks so appetizing, hearty and healthy! Thanks for the recipe! Hi! 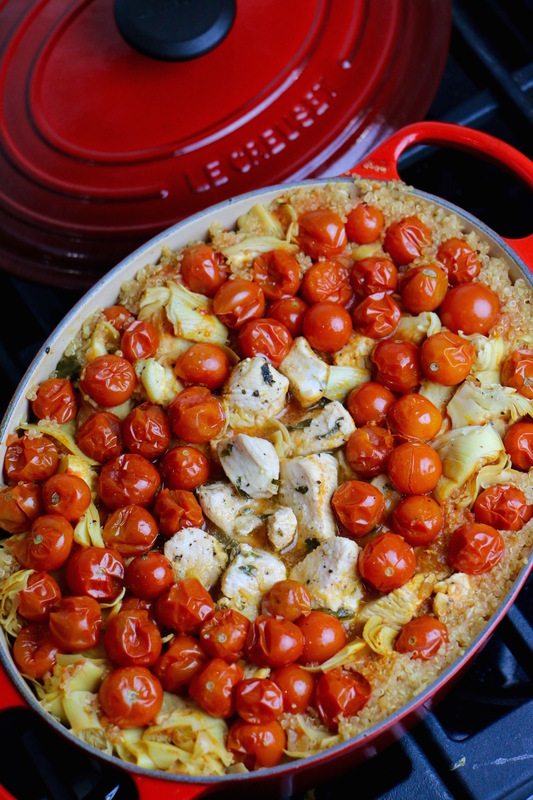 How many oz of diced tomatoes do you need for this dish? Could it be made in a crock pot? I haven’t tried but I definitely think you could! After step 6, I would put everything in the crock pot and cook on high for 4 hours. 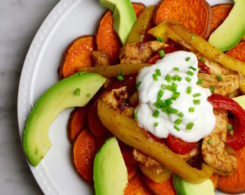 This recipe looks amazing and I’m going to give it a try this weekend! It’s turned to winter in my part of the world do this is a perfect meal! Thanks as always for sharing your incredible and tasty healthy ideas! I’d like to make this for a friend that just had surgery. What is the best way to make it and freeze it so she just has to pop it in the oven? Hi Chrissy! I think you could just make it normally and then freeze it in the baking dish and cover with a lid or tinfoil. Then have you friend just pop in the oven at about 275 F for 30 minutes. Made this yesterday as meal prep for the week. Soooooo good! And easy!! Will definitely be making this again!! Thanks for the recipe! 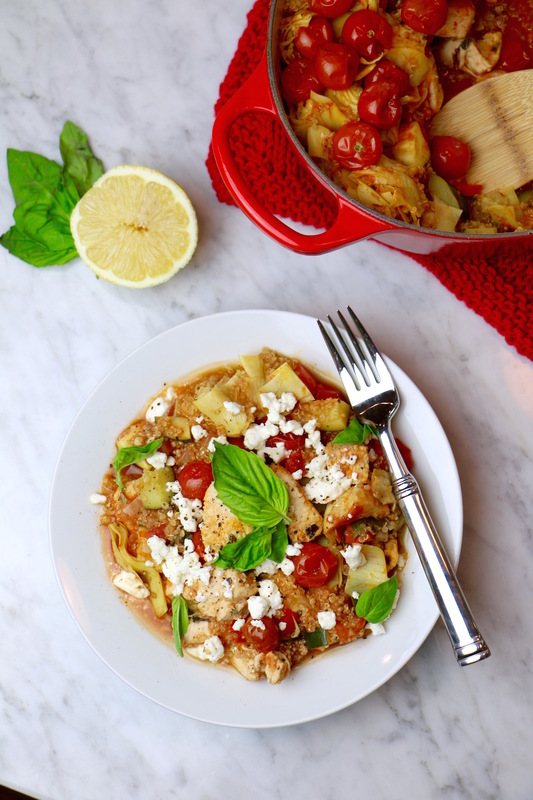 I was looking for something quick & healthy for dinner last night and came across your recipe! I even happened to have most the ingredients In the house already and only had to runout for a few things! This dish really was quick and fairly easy to throw together and my family and just loved! It was not only yummy but also a very festive lookig dish with all the pretty colors! I will definitely be making this again! Thank you for sharing it!! I’m so happy to hear you liked it!! It really is a festive dish with all the red :) Thank you for sharing! Are you supposed to precook the quinoa before putting it with the stock? 1 cup uncooked or cooked quinoa?